When I have "automatic login" activated, the "Unlock the Gnome Keyring" box asks for my password. But this happens three times. There are three boxes asking me for my password. In 10.04 the box appeared one time. Then when you login again & are prompted to unlock keyring, click "Details" & there will be an option to automate the unlocking process. You should now only be prompted the one time at login. It's possible to create several bundles of keys. However, you have to unlock every single bundle after logging in (and a program tries to access it). The keyring prompts are because your keyring and logon passwords are different or your system is set to autologon. The fix is to go to "Passwords and Encryption Keys" under System/Preferences right click on Passwords select "Change Password" set it to blank for no password (useful if your system is set to auto logon) or change it to your current logon password. The e-mail prompts may be some program is trying to check mail at logon. Disable the program or set it to save your password. 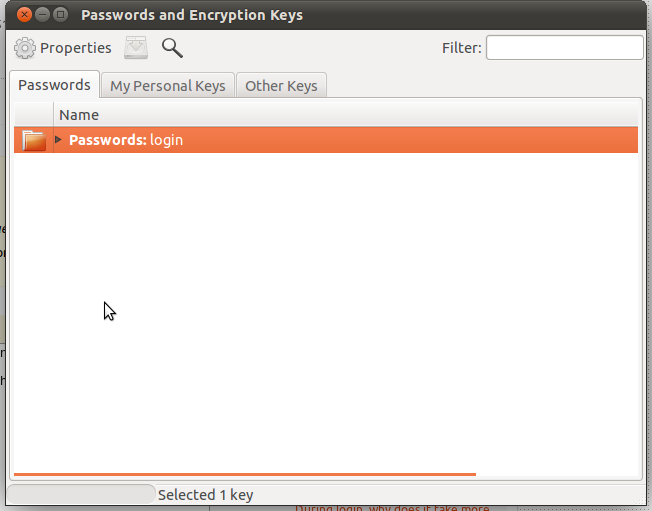 You could go into "Password and Encryption Keys" in your Control Panel. Right click on the Password: Login put in your current password and then leave the new password blank. This will stop this coming up also. I'm not quite sure but I think you should also be able to go to System -> Settings -> Password and Encryption Keys and then delete (right click on them) two of the three keyrings you should see in the list (tab Passwords). This would be sort of a combined solution of Open Help's and Dean Thompson's. I too had several password requests after auto-login (between 3 to around 8). I just deleted my chat accounts and now it only asked once! I know this is not a solution but it could help to pinpoint the problem. Get this patch, apply the patch to gkd-secret-unlock.c in gnome-keyring's source, rebuild the gnome-keyring package and install it. For more details on the bug and patch see Bug 744929 for gnome-keyring. Install it. Your package name may be different from mine. Note I'm on version 11.04, so I don't know if the patch will work for 10.10. Both have version 2.92.92 except the number is different after the .is. and I'm not sure what that indicates in versioning. Thanks to Felix Lawrence for providing the patch backport. When you login a box will pop up asking you to create a new keyring. Hope this works. Not the answer you're looking for? Browse other questions tagged 10.10 gnome login keyrings password or ask your own question. How to disable Multiple Keyring Popups? Want to remove Unlock login key ring when no keyring directory is there?